UAE gold jewellery prices inching closer to record highs; more increases likely this week: Time to buy or wait? Dubai: The precious metal is again inching closer to record highs and gold jewellery buyers in the UAE can expect to spend more when they hit the shops this week. Retailers across the UAE were selling 24-karat gold for Dh159.50 per gram as of 10.40am on Monday, showing a Dh3.50 rise in just a little over two weeks. 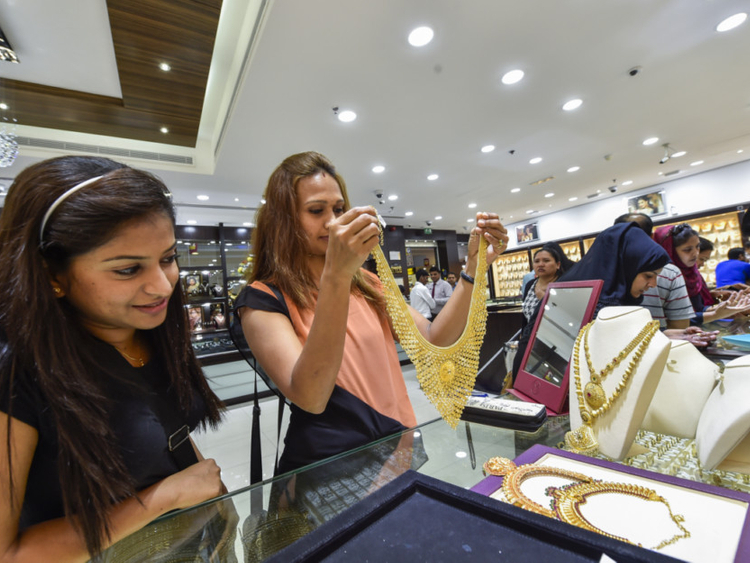 Last March 6, gold jewellery in 24K can be had for a lot less, at Dh156 per gram. Buyers of 22K, 21K and 18K gold can also expect to pay for a hefty rate, with suggested prices fixed at Dh149.75, Dh143 and Dh122.50 per gram, respectively. Analysts are betting on the bullion to increase further in value over the next few days, as the yellow metal continues to enjoy support from safe-haven buying. In the international market, spot gold rose 0.2 per cent to $1,315.98 an ounce as of 9:10am, according to Reuters. Gold jewellery prices in the UAE vaulted to their highest level in weeks last Thursday, following a US Federal Reserve decision to keep interest rates unchanged. “The precious metal witnessed a sharp rally in prices overnight as the FOMC (Federal Open Market Committee) came out with its most dovish policy shift in years,” Devesh Mamtani, head of investments and advisory for financial markets at Century Financial, told Gulf News. The bullion is expected to strengthen further this week, with 71 per cent of Wall Street professionals betting on the precious metal to surge ahead, according to Kitcos’s latest gold survey. The majority of respondents in the Main Street, about 68 per cent, also shared the same view. Georgette Boele, co-ordinator for foreign exchange and precious metals strategy at ABN Amro, said the precious metal is expected to remain strong due to a weaker US dollar. “We remain positive on the outlook for gold prices. First, we continue to expect a weaker US dollar. Gold prices have the tendency to rally when the US dollar declines. This relationship has proved to be relatively strong and stable over time,” Boele said in a research note.